the rotation you are using. If you are deviating from the rotation we advise in the relevant class guide, please specify to what extent (and why). 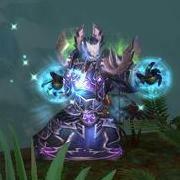 In case you feel you are under-performing relative to another player of the same class and spec in your raid, include their armory link and any other details about them that you can. Moreover, in this case, we advise you to first raise the issue with that player, to find out what he is doing differently from you. Please understand that simply stating "I'm only doing 15k DPS in item level 388, what am I doing wrong?" does not help us help you in any way.